Tiger Torre works out of her home in Baltimore, Maryland. She has been making hand molded, hand painted, wearable leather art since 1996. Alongside the masks and crowns, there are other leather goods and accessories made by Tiger. 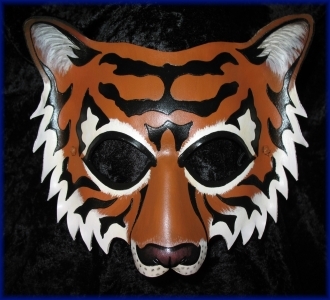 Tiger Torre Art's leather masks and crowns are truly wearable pieces of art, and each piece is signed and dated on the back. 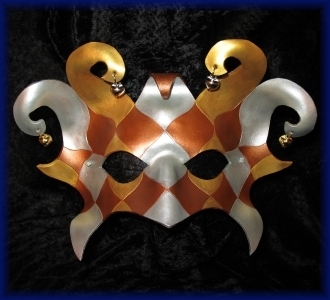 The masks and crowns are all made from one piece of leather. 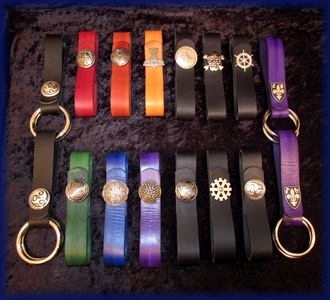 Each piece comes with a guarantee, and is ready to be comfortably worn or displayed. They range in price from $40 to $300. Tiger can work with people who wear glasses in person at any of our shows or events. 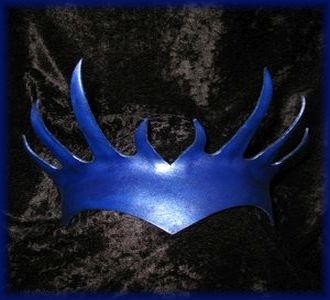 Choose any of the categories in the Masks & Crowns menu above for pictures and information about the leather masks and crowns. 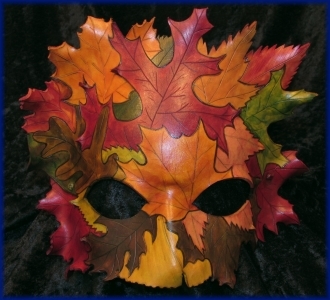 In case you are wondering why you need to own a leather mask, consider the many things leather masks can be used for: A wardrobe piece to be worn for Halloween celebrations, masquerade balls, costume contests, and parties. A lovely accessory to wear at your favorite club, or for momentous occasions. A distinct item of garb for Renaissance Faires or SCA events. A costume piece for stage plays, drama classes, and theatre departments. 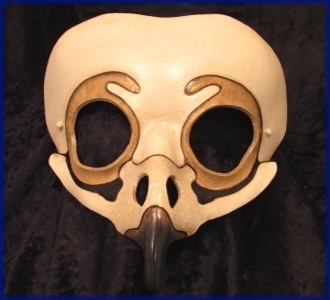 A leather mask is a unique fashion statement that can lend its wearer confidence. 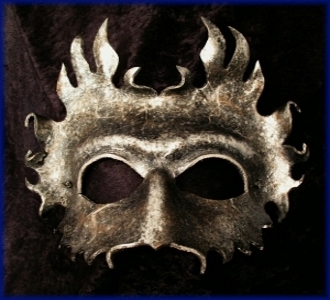 In a leather mask, you can become a new character, a different version of yourself, or an artistic muse. And last, but certainly not least, leather masks are beautiful pieces of art to hang upon your wall and admire when you are not wearing them. 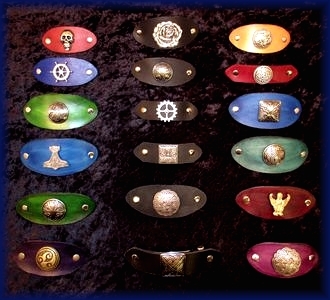 Tiger designs and makes codpieces, mug straps, skirt hikes, eyepatches, barrettes, pins, keychains, and a variety of fantasy leather gear. 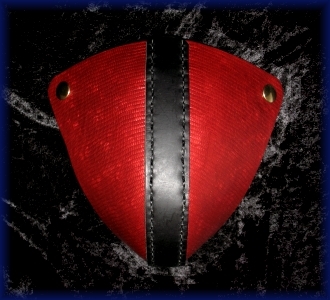 Choose the Other Items menu above to see pictures and information about Codpieces, Accessories, Blindfolds & more. For art that isn't leather related, please check out Redbubble. For more information about the folding fans and pouches that Tiger Torre Art sells, please click the Other Items menu above and choose Folding Fans. Tiger Torre Art will be at the MD Renaissance Festival each Autumn, in a blue booth on Stub Toe Lane. This is our only "store front". During Ren Faire season, from mid-August through the end of October, e-mail responses and orders may be delayed, and stock numbers will fluctuate. We highly appreciate your patience during our busiest time of year! 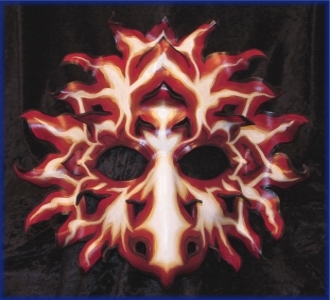 Wondering what masks and other products we have in stock at the moment? You can check our In Stock page for a listing of our current in stock products. All orders are placed via e-mail, and In Stock items can be ordered easily. If an item you like is not in stock, please e-mail Tiger to inquire about the possibility the item being made to order. Thank you! Thank you for visiting Tiger Torre Art.